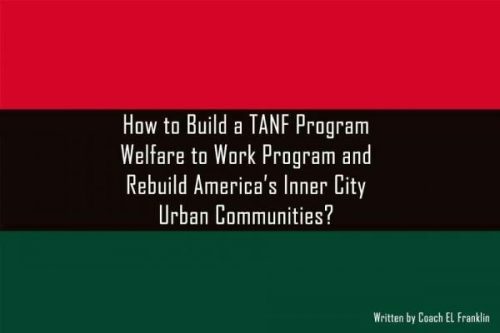 Chicago community development organization Co Op Community Development has launched the book "How to Build a TANF Program Welfare to Work Program and Rebuild America's Inner City Urban Communities?". Authored by Eddie L Franklin, the book offers strategies to develop struggling inner-city communities. Chicago community development organization Co Op Community Development announced the launch of a new book by author Eddie L Franklin. The book is titled “How to Build a TANF Program Welfare to Work Program and Rebuild America’s Inner City Urban Communities?”. The ebook will be available in iBooks, ePub, and PDF versions and offers an in-depth causative analysis of foreclosures among homeowners in Chicago inner-city communities and the subsequent national and global financial impact. The book focuses on helping communities build and sustain multi-channel development strategies at individual and collective levels. TANF (Temporary Assistance for Needy Families) is a family program by the US Department of Health & Human Services. The program is designed to provide needy families with financial assistance based on grants from the Federal government to State governments. One of the key focus areas of the program is to reduce individual and family dependence on government welfare. The book presents a case for the effective deployment of the TANF program to empower individuals, especially those from minorities to become productive contributors to their local communities. Author Eddie L Franklin takes readers through a broad spectrum of social and anthropological viewpoints to assert the need to enable people being released from prison to gain employable skills, obtain training, and migrate out of the welfare system. The book seeks to address the social struggle of individuals feigning mental and physical illness in order to obtain welfare. Franklin discusses subsidized labor, the rehabilitation of housing, and finding socially and economically sustainable solutions for former prison inmates. The book’s strategies also focus on helping communities invest in future-ready IT skills for their children.